He arrived in France with the Battalion on 27 September 1915 and was Killed in Action during the Battle of the Somme on 20 July 1916 aged 25 years. 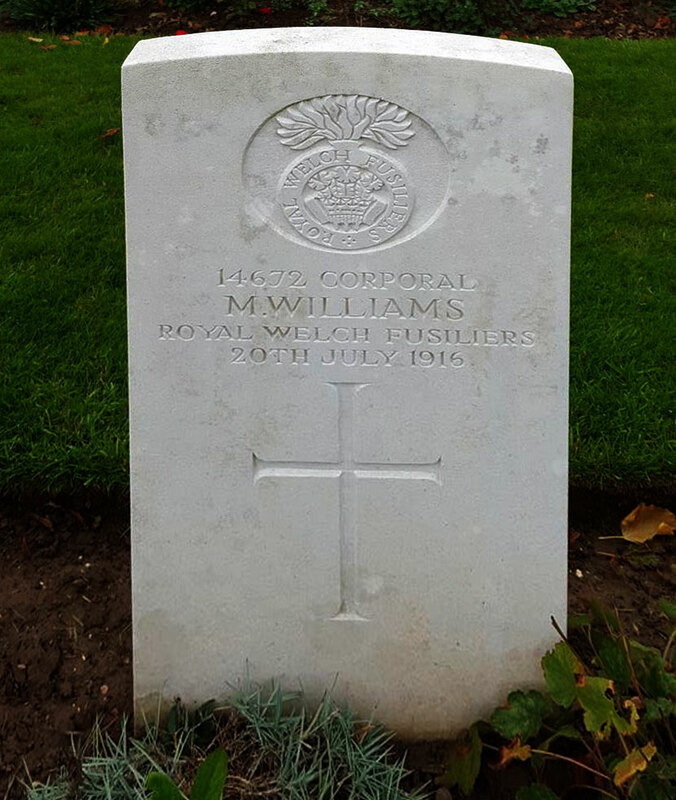 Mesech Williams was born in Holywell, Flintshire during 1891. The 1911 Census states that the family resided at 1 St. Winifred’s Terrace, New Road, Holywell. The head of the family was Thomas Williams aged 49, a Colliery Hewer. His wife Rebecca Williams aged 46 and their three sons, Thomas Williams aged 23, a Labourer, Mesech Williams aged 20, a Shop Assistant and William Williams aged 18, a General Labourer. 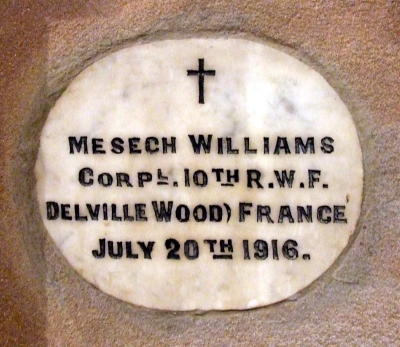 William, Mesech’s younger brother was also killed during WW1 and his name appears on the Holywell War Memorial. On 7 June 1915 Mesech Williams enlisted with the Royal Welsh Fusiliers at The Drill Hall, Halkyn Street, Holywell. On 3 October 1917 a payment of £10.6s.6d was made by the War Office to Thomas Williams, this being monies owed to his son. On 22 October 1919, a further payment which is recorded as a War Gratuity of £9.10s.0d was also made to him. There is a Flintshire Roll of Honour card for Mesech Williams at the County Archives Office, Hawarden. Details of his medals were obtained from www.forces-war-records.co.uk.